Bioengineers at University California-Davis have developed a microfluidics chip, also known as lab-on-a-chip, to test for latent tuberculosis. The researchers, Davis biomedical engineering professor Alexander Revzin and research specialist Ying Liu, expect the test device, for which a patent has been filed, to be less expensive, reusable, and provide results in real time. Tuberculosis, or TB, is an infectious bacterial disease, which most commonly affects the lungs, and is transmitted from person to person via droplets from the throat and lungs of people with the active respiratory disease. The immune system of healthy persons will keep latent form of the disease in check. However, people with compromised immune systems, such as those with HIV, are particularly susceptible. Current tests for latent TB, say Liu and Revzin, are based on detecting the chemical interferon-gamma, which is made by cells of the immune system to combat TB. Commercially available tests for the chemical require sending samples to a lab, and can be used just once. 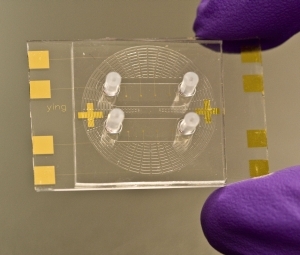 The chip designed by Liu and Revzin also tests for interferon-gamma, but in a different way. They coated a gold wafer with short pieces of a single-stranded DNA segment known to stick to interferon-gamma. They then mounted the wafer with the DNA in a plastic chip with tiny channels for blood samples. At present, the component to read the electronic signal is separate from the chip, but the researchers plan to refine their invention to include both elements on a single device. The team has already conducted testing of blood samples from patients in China and the U.S.
A patent application has been filed for the technology, say the researchers, who hope the test can be commercialized after FDA approval.